Canada Goose vs Nobis: Which Brand is Better? 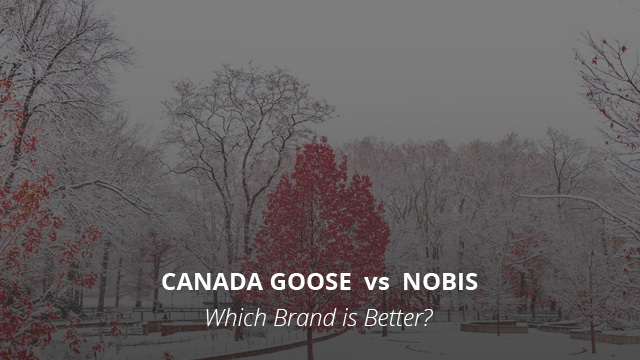 In this week’s brands comparison we will be looking at Nobis vs. Canada Goose. These are two competitors amongst each other and not solely for the products, but also due to their past history. We enjoy comparing brands not only because it helps you to get better informed about different brands, what they stand for and the quality of their products, but it also helps you make a better choice when it comes to your next jacket purchase, as you will have a better idea as to which brand best fits your requirements. Canada Goose has been the most featured brand in these comparisons we are making, and the reason for that is the brand’s high quality, high demand and the considerable number of competitor brands out there. With that being said, let’s get started with today’s comparison review. Founded in Canada 62 years ago, Canada Goose first started out as a brand that designed and manufactured raincoats, woolen vests and other outerwear under the name of Metro Sportswear Ltd.
After their increase in popularity and the creation of their first down jacket in the early 1970s, the brand then launched their products into the European market in the 90s and that’s when the name “Canada Goose” came to be. Ever since then, through the high reputation for the quality of their products, especially their down jackets, the comfort, warmth and other factors, which are discussed more in depth in this article, Canada Goose has constantly increased its customer base and has expanded its reach to countries all over the world. 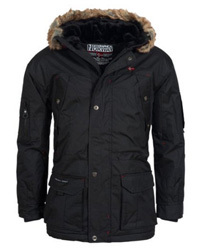 Those who live in very cold areas, where temperatures that fall below 0 degrees are common during winter, know too well the importance of a quality insulated coat and Canada Goose is one of the most common jackets you will see on the streets of New York and other states in North America where winters are harsh. As a brand, Canada Goose is well-known for its high prices and to some those prices might be unreasonable. We discuss prices in a different paragraph below, however it bears mentioning here as you will get to learn more about the materials they use and the manufacturing process of their jackets, in particular. A 13-step process, during which every small detail is meticulously checked and evaluated in order to make sure that there are no mishaps and that everything is up to standard, is what a typical Canada Goose jacket goes through. The finished product is one that comes in perfect condition and with no flaws to fuss over. It’s for that reason that their jackets last for such a long time, in some cases even for decades! Moving on to materials, the most commonly used fabrics are Nylon and Polyester, however other materials such as high quality merino wool is also present in some of their smaller products, such as caps. The insulation is where it’s at with Canada Goose, as they use high quality goose or duck down, with a high fill power, which provides great loft and insulation. The insulation meets the Responsible Down Standard, which ensures that the down is fully traceable, from mature birds that were humanely treated, neither live-plucked nor force fed and are a byproduct of the meat industry. Lastly, a detail that you will come across in their jackets is the fur trim on the hood. Canada Goose uses Coyote fur which is of the highest quality, soft and hygienic, and a result of population controls in the regions of the southern parts of Canada. Related: Canada Goose Fake vs Real Jacket: How To Spot It? The popular design we have picked comes in both men’s and women’s versions, and it’s the Expedition parka (check out men’s version and women’s version on Amazon), one of the brand’s original designs that is said to be one of the warmest parkas ever. It has a shell made of 85% Polyester and 15% Cotton, insulated with 625 fill power white duck down. The hood is oversized and lined with Coyote fur trim to protect the face against the cold and snow storms. 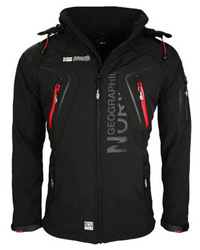 It comes with a number of outer and inner pockets, making it a practical design for outdoor ventures. It is adjustable at the waist and hood, and it also has elasticized sleeve cuffs, which are ribbed and knitted. As we mentioned, and as you may already be aware of, the price range of Canada Goose jackets and products is not the most buyer-friendly. Typically the jacket price starts at $500 and can go over $1,000 depending on the design. If what you are looking for is a product that is guaranteed to provide the best quality, be it in performance or longevity, then definitely, their jackets are worth the price. Nobis is also a Canadian brand, which was founded in 2007 by the former Vice President of Canada Goose, Robin Yates. He left Canada Goose in 2006, because he wanted to create products that fully satisfied customer requirements. Their down jackets are light, eye-catching and provide full weather protection, making them suitable for both daily wear, as well as for those spending time out in nature during the colder months of the year. Nowadays the brand is present in more than 40 countries worldwide and their jackets are innovative and versatile, suitable for those who are not solely looking for a warm and performance jacket, but also one that looks stylish and fashionable. The brand has been featured in several fashion and other renowned magazines for its quality of designs and the versatility and variety of styles and options. Let’s now take a look at the materials used and then see a couple of their popular jackets. Much like other high quality brands, Nobis has also developed its own special fabrics and laminates, which consist of different blends of Polyester and Wool, Cotton and Nylon and variations in between. Their laminates are made to be breathable and fully weatherproof, with a water column rating of 10,000mm. Breathability is aided with underarm vents in some of the jackets and the fabric is DWR-treated in order to further aid in weather-resistance, thus preventing the down from wetting out. The duck down insulation used is of Canadian origin and it meets all of the RDS requirements, meaning that there are no ethical mishaps in the sourcing of the down insulation. The lining used in their down jackets is down proof, ensuring that there won’t be shedding of down and feathers during wear. 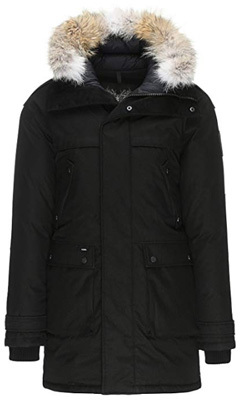 A winter parka cannot be imagined without a fluffy fur trim on the hood. Nobis uses Coyote fur for their trims. The manufacturing process is as meticulous as you’d expect from a brand of this quality and especially from someone who knows firsthand what high-quality manufacturing looks like. 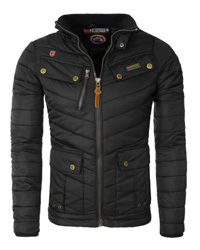 These jackets are very well made in terms of overall quality both due to the manufacture and the fabrics used. Since Nobis has not been previously featured in our selections and reviews, we have chosen two jackets to look at. 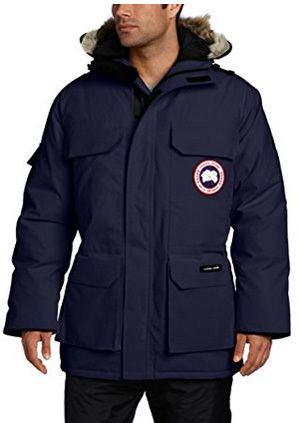 The first one is a men’s design, the Yatesy parka (check it out on Amazon), one of the brand’s best selling parkas. It is made of 100% Crosshatch Polyester shell, with Sympatex laminated membrane and sealed seams to protect against the elements, making this parka both wind and waterproof. For protecting the face, the hood is slightly oversized and comes with coyote fur trim. The lining is highly breathable and down proof. For added breathability there are also pit vents with zipper closures. It comes with white duck down insulation and several outer and inner pockets. Its cuffs are ribbed and knitted, with thumbholes in them, and the main zipper is two-way and covered by a storm placket. The design for women is the Merideth parka (check it out on Amazon), a long design with coyote fur trim on the hood, ribbed cuffs and a 100% Polyester shell. It is insulated with white duck down and its collar and hand warmer pockets are lined with anti-pilling fleece, which helps keep the neck and hands warm. Also lined is the hood, which is lined with melton wool that can be removed. 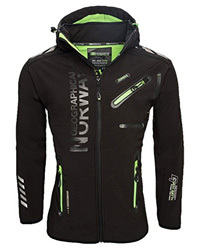 Its main zipper is covered by a storm placket and there are several pockets that make this design quite practical. 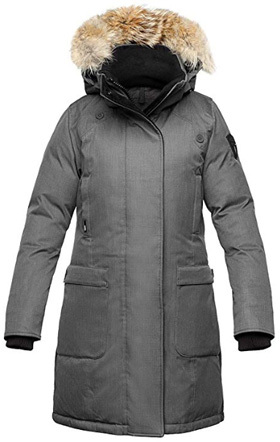 In regards to price, Nobis is a luxury brand, with the average down jacket costing around $700. Some designs can go upwards of $1,200, making it quite an expensive brand overall. Considering quality, performance and also the beautiful designs of these jackets, and also based on online feedback, then the answer is Yes. In this case, it’s a bit difficult to give a clear answer as we are dealing with two very similar brands in regards to quality and performance. It would be a better idea to compare specific jackets to each other, and if we are to go by this, then it’s nearly impossible to outdo the Expedition parka or the Chilliwack bomber jacket by Canada Goose, both in insulation and longevity. However, in regards to style and overall weather protection, Nobis certainly has the upper hand as it provides a wider selection of designs and the waterproof fabric comes in handy when you are out in unpredictable weather, which is common during winter. With price ranges being also comparable to an extent, Nobis being slightly more expensive, it all comes down to preference and whether you are looking for style or just straight up performance.